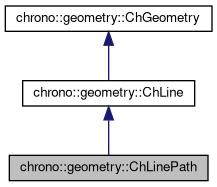 Geometric object representing an sequence of other ChLine objects, The ChLine objects are assumed to be properly concatenated and to have C0 continuity. Return the start point of the line. Return the end point of the line. Get the nth line duration. Set the nth line duration. Erase a line from a specified index n in line array. Note that n cannot be higher than GetLineCount(). Check if the path is topologically connected, i.e. Tells the duration of the path, sum of the durations of all sub-lines. This is useful because ifyou use the Evaluate() function on the path, the U parameter should range between 0 and the max duration. Insert a line at a specified index n in line array. n index of line, 0 is first, etc. Shrink or stretch all the durations of the sub-lines so that the total duration of the path is equal to a specified value. For example, you can normalize to 1 so you can use Evaluate() with U in the 0..1 range like with other lines.